As a privately held, family-run company with a substantial global footprint, the client had realized some time ago that relying on commercial airlines was an impractical way to conduct business. For more than 15 years, the family-run business enjoyed the benefits of fractional aircraft shares for their business travel requirements. They started with a small executive aircraft, which made business travel so efficient that they found themselves increasing their fractional shares. With four family members utilizing the aircraft, 75% of their fractional ownership travel hours went towards business while the remaining 25% was spent on personal use. In 2017, the family sold their business to a group of investment companies. While they no longer needed to travel for business, the family decided they would like to continue flying privately for their personal needs. As part of the acquisition of the business, the buyers also purchased the fractional share the company owned as part of the transaction. Although the family had a decade-long relationship with their fractional provider for business use, transitioning to personal fractional share required a different strategy to meet their future travel requirements. 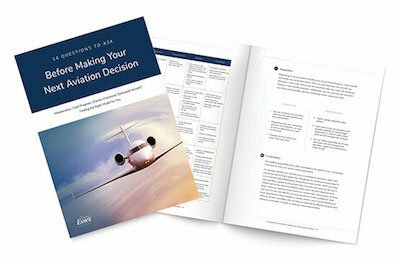 Identifying the type of aircraft that would satisfy their aviation needs. Determining any potential conflicts in scheduling. Helping the family understand the financial benefits of each option. The family worked with Essex to review the options available from their then current fractional provider and also received proposals from other providers. Essex worked with the family to review and identify their best options and, for a variety of reasons selected, to go with a new provider. The family started with a 75-hour fractional share which they leased and later transitioned into a 150-hour share per year to accommodate their increased personal travel requirements. Essex was able to use their expertise and industry knowledge to perform an initial evaluation and holistic review of all the available options for the family. They also assisted the client with navigating through all of the necessary negotiations and final contract process. Essex continues to provide thorough aviation consulting services to assist the family whenever they need to add more hours to their contract, explore new options or negotiate the most practical solution.